This is the third reprint by Dirk Vlasbloem of Schoutens journal in Latin (first & second, both 1648). All of these Vlasbloem editions are extremely rare. Tiele and the index of this book gives 6 plates for this Vlasbloem edition which would thus be complete. In our copy the map of the Southsea is added in manuscript. Sabin states that "The map of the South Sea is evidently not included in the plate numbers on page 71 and is probably lacking in some copies. There is no doubt however of its belonging to the book". Both le Maire and Schouten, who split up during the voyage, claimed the discovery. Both wrote their own journal. 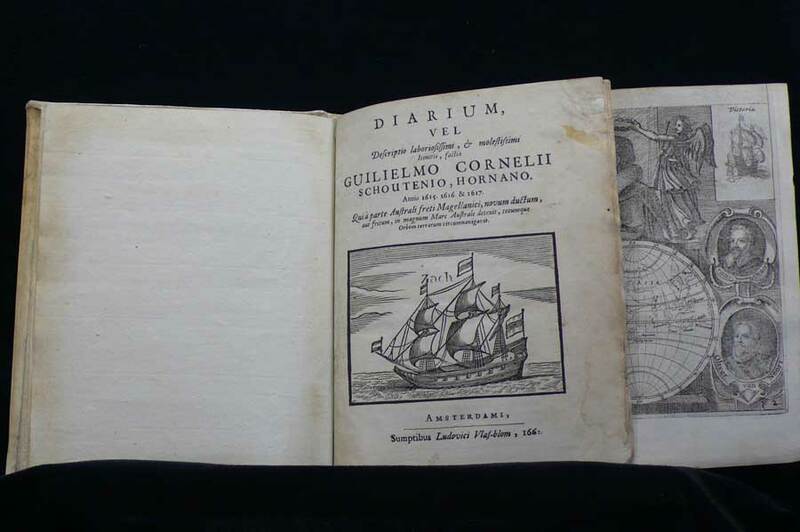 Schouten was the first to publish his version of the circumnavigation (this book, 1618) while le Maire, who died on the way back home after having been imprisoned in Batavia for breaching the VOC monopoly on sailing through the Street of Magelaans had his story first published in 1622 (see our copy of the Herrera, 1622). Sabin states that Schoutens journal was quite certainly not written by Schouten but composed by Blaeu from different log books of the journal especially the one of the commissary Arie Claeszoon.